The biannual CMO Report is back, with analytics on the mind; it's winner take all with AI; the battle for voice supremacy is upon us; testing autonomous vehicles with pizza; USA Today's surprising mobile website move; Amazon isn't really ruling retail; WhatsApp means business; Google and Apple are battling on AR too; media IPOs to watch; podcast discovery is in; discerning the rescue efforts you support; Uber's new CEO is on the job; go visit a library; and more in the CMO Survey edition of The Full Monty for the week of September 4, 2017. See where Brain+Trust is speaking in the final section below. Spending on analytics is expected to increase from 5.5 percent of marketing budgets to 18.1 percent in three years; but spending has changed little since 2012. Marketing analytics are employed in 37.5 percent of business decisions, but only 1.9 percent of firms say they have the right people in place to leverage the information. Hiring in marketing is expected to increase 6.6 percent over the next year, with banking, finance and insurance reporting the largest planned hiring. Outsourcing of marketing is also expected to increase over the next year, by 5.1 percent. Spending on social media continues to grow, with B2C companies planning to spend 31.9 percent of their budgets on social media in the next five years. "Being the voice of the customer at the leadership table" was ranked as the most important role for an effective CMO. And one point from the video below that stands out to us at Brain+Trust Partners: while plenty of effort it placed on a digital strategy, there's less rigor involved on creating a digital organization. Our philosophy about digital business transformation: it takes changes in people, process, and technology — in that order. Russian president Vladimir Putin indicated that "artificial intelligence is the future" and it comes with "colossal opportunities." Further, he said, "Whoever becomes the leader in this sphere will become the ruler of the world.” Just as the USSR and the US were in a space race in the 1950s and 60s, so too are we in an AI race now. The Russian bots on Twitter make that very clear. Over on Yelp, those colossal opportunities are being taken, as AI writes Yelp reviews that pass for the real thing. The ability to replicate human actions like this online will fundamentally undermine a lot of the trust we have in place because of them. At KFC in China, Alibaba customers can use facial recognition to activate payment for their orders. "Smile when you pay that." We (or rather the machines) are learning so much so quickly that we stand at a point in the business world where the advance of AI is like going from camels to cars, as Saudi Arabia did, writes Avinash Kaushik. Amazon is adding hundreds of engineers to the Alexa program and giving it hiring preference over other divisions. Apple still has the greatest reach among voice assistants, with Siri accessed monthly on more than 375 million Apple devices across 36 countries. Amazon also has been aggressively signing deals with other companies to add Alexa to products ranging from Ford Motor Company cars to Sears Holdings Corp.'s Kenmore refrigerators. Daimler is evolving its Smart Car to include sharing, self-driving and electric drive. Trifecta—just the thing to ensure Silicon Valley pays attention! This week, the House of Representatives will vote on legislation to speed the deployment of self-driving cars without human controls and bar states from blocking autonomous vehicles. USA Today managed to create more engagement and lengthen the time spent on its mobile website — by 75 percent — by mimicking Facebook's mobile web design. BuzzFeed will be running banner ads, effectively admitting to that ad industry that native advertising alone is not enough. You might think Amazon is ruling retail, but analysts at Moody's say you should think again: while Amazon dominates online commerce, those sales account for just 10 percent of the industry as a whole; and its Whole Foods acquisition only makes up $20 billion of an $800 billion market. Brick and mortar isn't dead; modern retail is actually killing mediocre retail. The common features of much of e-commerce is that customer acquisition is so expensive that it makes profitability a challenge. According to security analyst Brian Krebs, a huge collection of bot accounts may be able to abuse Twitter’s anti-abuse tools to temporarily shutter the accounts of real people suspected of being bots. The bot problem on Twitter has become a real issue, and the company needs to do something about it. See item #1 in Artificial Intelligence, above. Facebook is cracking down on fake news where it hurts: the network will block publishers from running advertising if they share fake news. Facebook-funded shows begin rolling out this week on Watch, as publishers including Business Insider, Tastemade, Refinery29, and Nat Geo debut original video content directly on the platform. More evidence of the long-held view that Facebook TV is coming. WhatsApp is preparing for business accounts, including verified accounts and a standalone app for corporations to chat with customers. WhatsApp's cofounder talks about how it reached 1.3 billion users and still retained its focus, even after the record-setting $19 billion acquisition by Facebook. Instagram Stories can now be seen on its desktop version; the photo sharing app says it will also allow uploads through its mobile website soon. An Instagram hack hit millions of accounts and exposed email addresses and phone numbers. A site, now offline, sold access to hacked users' contact info for $10 a search; Instagram now says non-verified users may have been impacted. You and Selena Gomez may have something in common. Facebook unveiled a center in Brazil to teach coders and entrepreneurs career skills. The center officially opens in December and aims to assist 7,400 Brazilians in its first year. That's some social good. Even though Snapchat’s total user base is growing much slower than people expected and Instagram keeps copying it, the amount of time its users spend using the app is growing at a nice clip. In the coming months, YouTube may allow people to swipe to move from one video to the next. If they insert ads between videos instead of attaching them to individual videos, would that appease advertisers concerned with how they are associated? Google launched a preview of ARCore, a platform for Android developers to make AR apps, following iOS' ARKit. The platform will initially target Google Pixel and Samsung Galaxy S8 phones. Google is under enormous pressure to compete with Apple's own AR efforts. Is this enough? AR company Magic Leap filed a patent that shows prototype AR glasses. Condé Nast and Facebook are debuting a virtual reality dating show, a series that pairs up real people on blind dates in VR to see if their VR personalities make for a real-life match. It's hard enough creating a semblance of an idyllic happy life on Facebook and Instagram in 2D. This sounds like too much work! Facebook bid $600M for online streaming rights of a popular cricket tournament in India for 5 years but was outbid by Star India. Apple and movie studios are in a contract dispute, as Apple wants to hold the price of 4K movies at $20 in iTunes, ahead of the launch of the new Apple TV. The next big media IPOs to watch are Spotify, Roku, and Vice. Speaking of which, on Friday Roku filed for a $100 million IPO. It is the top streaming media device in the U.S., dominating the market with a 37% share of streaming devices in homes, up from 30% last year. Podchaser's beta is open. It has been called the IMDb for podcasts, and is set to help with categorization, reviews, and discovery. NuVoodoo and Amplifi Media conducted a study looking at podcast discovery and advertising retention. Nineteen percent said they subscribe to 4-6 per week. Six in ten (60 percent) said they find out about new podcasts from social media, followed by friends (57 percent), podcast apps (49 percent), other podcasts (45 percent) and articles (41 percent). Nielsen now has podcast insights in a new report. The report examines the preferred brands and spending volumes of podcast listeners in categories such as bottled water, beer, and baby food. It also notes that non-white podcast listenership has increased over the past six years, from 30 percent in 2010 to 36 percent in 2016. Spotify's head of original video and podcasting, Tom Calderone, is leaving as the firm rethinks its video strategy, tying it more closely to music. Program of the Week: This week's show is Startup from Gimlet Media, recommended by Patrick Hennessey. Startup is a podcast about what it's really like to get a business off the ground. Do you have a program to recommend? Add yours to our Google Sheet: smonty.co/yourpodcasts. As you're moved to make donations to Hurricane Harvey victims, please note that there are scam organizations out there trying to take advantage. This should help you navigate the space. Sad that we have to be aware of this kind of behavior, but the good news is there are reputable places to donate to as well. A global vulnerability in hotel keycard locks was a security disaster and an opportunity of a lifetime for The Hotel Room Hacker. As you move services to the cloud on behalf of your company, here are the top security factors to consider. Same-day delivery startup Deliv is expanding to 1,400 cities, rivaling Amazon's Prime Now. The gig economy is difficult for workers; Hollywood's union model may be an example to follow if they want to stand up for their rights. Repairing a culture rife with sexual harassment. Restoring public perceptions of the company. Settling copious legal problems, including one involving the company’s largest investor. Finding short-term liquidity for some employees and investors. Hiring a competent, mature management team. Fending off a growing challenge from competitor Lyft. Oh, and managing the lurking presence of his predecessor, former CEO Travis Kalanick. Oops, one more: an investigation by the U.S. Department of Justice over the possible violation of bribery laws around bribing foreign officials. Hey, at least Uber is consistent, I'll give them that. 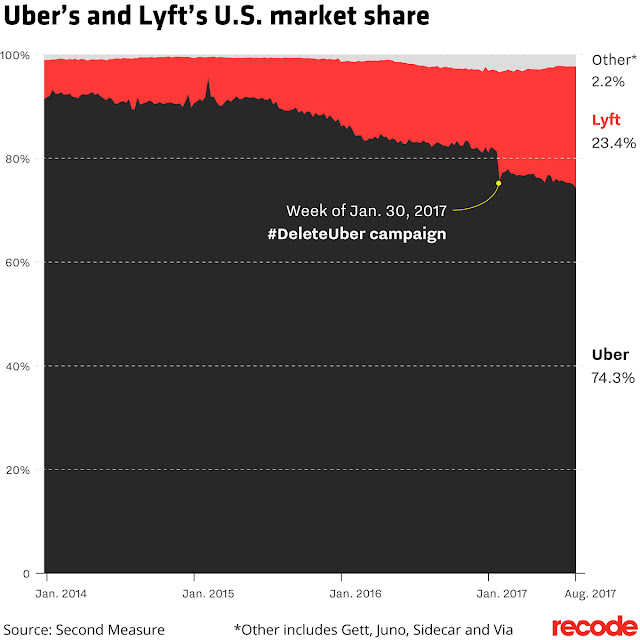 All of this has affected Uber's market share, which was around 91 percent in early 2014 and now stands at 74.3 percent. Meanwhile, Lyft is expanding into 32 additional states. When you want to know more about your customers or users, it's always a fine line between seeming too intrusive and not unearthing enough. Here's how to collect data without being creepy from MediaShift. Most Americans — including Millennials — say that libraries can help them find reliable, trustworthy information. As long as you're at the library (getting books, we hope! ), here's some helpful advice on how to retain more from the books you read in 5 simple steps. And finally, here are some beautiful and haunting images of 1960s postcards matched up with their present-day abandoned resorts, shared via photographer Richard Binhammer. 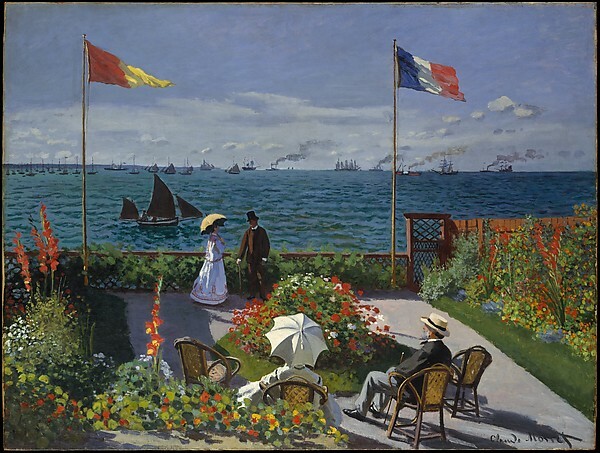 Top photo credit: Garden at Sainte-Andresse by Claude Monet, courtesy of the Metropolitan Museum of Art.